"Farewell Airport could have been a forward staging area to bring in equipment and supplies by helicopters to the 'Square' that you mentioned." - - Airline Pilot and Retired USAF Lt. Col. The alleged underground pyramid structure west of Mount McKinley has provoked a lot of email since my original Earthfiles and Coast to Coast radio interview with Doug Mutschler, retired U. S. Army Counterintelligence Warrant Officer, with information about an underground pyramid that was posted on July 26, 2012. 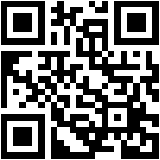 See: Updated Parts 1 - 3: 072712 Earthfiles. On July 27, 2012, I received more email information about a "dark pyramid" underground in Alaska west of Mount McKinley from the 46-year-old adopted son of a retired Western Electric engineer, who allegedly worked between 1959, the year Alaska became a state, and 1961 on a powerful electrical system emanating from a very large underground pyramid of unknown origin in Alaska. See: Updated Real X-File Parts 1 - 5: 082312 Earthfiles. Highpower Creek: stream, head is in Mount McKinley National Park, flows NW, then SW 58 miles to Swift Fork Kuskokwim River, 55 miles NE of Medfra, Kuskokwim Lowland; 63* 25' N, 153* 07' W; BGN 1964; (map 89). Variant names: Black Creek, Hipower Creek, Slow Fork, Slow Fork Kuskokwim River, Slow Fork Swift Fork Kuskokwim River. Local name reported in 1958 by USGS. 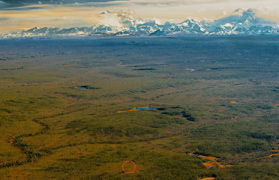 This helicopter image from 3000 feet in the air does not show a square, but more a ragged-edged circular area about the size of a football field in which the black spruce do not grow thickly as the spruce do around the Site. The marked Paths might be more related to animal traffic than historic, cleaned up terraforming. 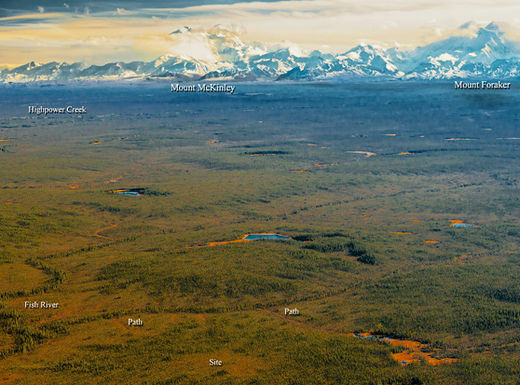 The nearest flowing water is Fish River, and about five miles southeast toward Mount McKinley is the unusually named Highpower Creek. Seasonal Variation of Flora - we don't know when the Google Earth Image was taken with respect to month or year. From the image in Google earth, the reason the square stands out is because there is color differentiation between the four sides of the square and the surrounding flora. The area in general has two shades of green. One darker green which outlines the square and several other abstract shapes in the same general vicinity, and a lighter greenish, yellowish, tan color that seems to define the areas adjacent to the numerous creeks/streams in the surrounding area. This color differentiation serves to outline both the abstract dark green shapes as well as the square anomaly. However, since we have no idea of the nature of the flora in the Google Earth map, we don't know how it may vary in color with the season in which sunlight duration and intensity, temperature and water flow in the creeks changes. Therefore it may very well be that the color differentiation that we see is not there when the flora all turns to a dry brown say as winter approaches. The elevation of the area around the square anomaly was very flat. The slopes of the sides were very small % of the total length, with changes in the elevation on the order of 10 to 15 ft over 1500 foot square. It's also worth noting that while we tried to study the anomalous "square" Site in Google Earth, we were frustrated by out-of-focus blurring below a certain altitude, while other surrounding areas are clearly in focus down to tree sizes. The same focus problem occurs at Highpower Creek - no low altitude images are in focus. Is the selective blurring deliberate? Further, I learned that in 1998, the Pacific Air Forces (PACAF) initiated "Operation Clean Sweep," in which abandoned White Alice and DEW Line stations in Alaska were remediated and the land restored to its previous state. Could the surface land above the alleged dark pyramid have been cleaned up, too?